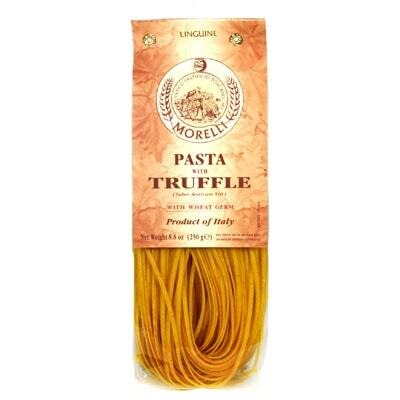 Already full of wonderful flavor, these Linguine with Summer Truffle is from Pastificio Morelli in Tuscany. Its main ingredients are egg, wheat germ, and of course some fragrant truffle. And because of the presence of truffle, it is best to use light sauces with this pasta. Or you can also simply toss it with butter and Parmesan cheese. The simpler the sauce, the better. Pastificio Morelli is a family run business in Tuscany since the year 1860. They create all kind of pasta shapes. Among the most important ingredients they add to their scrumptious pasta is a wheat germ concoction. Curious now? No worries. Simply place your orders now and this lovely string pasta will be on route.